So like a lot of us, i drift from one project to another, and back again. Spend too long on one and get bored so do another for a while. After spending ages on my 1m long Omega class Destroyer, (http://scifimodelaction.com/sfmaforum/index.php?topic=6666.0)i needed to do something different, so after finishing off a 1/35 military kit, i switched to another spaceship. Have finally finished designing my Sulaco for 3d printing. She's set to be about 800mm long, which will actually fit on my bookshelf. The antenna etc on the front are about 150mm of that 800mm, so she actually seems quite small. It would scale up (or down) though, just have to use bigger screws. I started printing it last night, and will be a couple of weeks until all the parts are made, havent done a count yet but guessing about 150-200. Am still adding detail to 2 last parts, the front face where the antenna mount (adding piping, ducts, panels etc), and same on the rear engine panel. Theres still a lot of scope for adding detail with styrene, and she'll have a 12mm aluminium tube running down the centre for strength and rigidity. I've made the dropship bay underneath open so i can light it, and am working on a little drop ship to put in it, but thats only going to be about 30mm long so wont be heavily detailed. Love that ship! This one is pretty large again, where do you keep them? "I don't know, is there anything you can do?" Awesome ship. I didn't realize it took that long to print stuff. Wow. Anyway, that should be pretty cool when done. No kidding on the quotable movie. I think I have seen that like 6 times. Great stuff. "Why don't you put her in charge." It is one of the most quotable movies ever. And not to forget the classic: "Get away from her you b!tch!" Got a heap printed on the weekend, and have most of the structure built. I've designed it so all the internal frame gets screwed together, and then attach the detail panels afterwards. I'm a little unhappy with the frame in the front section, didnt go together as easy as i'd like. I've already re-designed that part so will re-print it. Theres also a few parts that once printed i could see things that could be changed, so have a few bits to tweak. But made good progress! 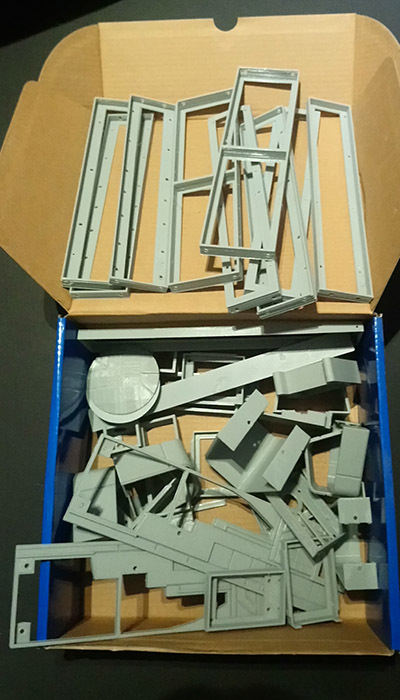 Q: Do you plan to replicate all parts with 3D printing, or would you build the basic framework and sort of build the models like ILM's Star Wars ships, being scratchbuilt/kit bash'ing. It will be almost entirely 3d printed. Will only be using styrene for fine details, piping, etc. Any possibility of sharing the 3D files on Thingiverse or similar site? Amazing work. Once its finished and i'm happy with the design i'll probably look at selling it if theres interest. "Nuke the entire site from orbit. It's the only way to be sure." How the heck do you do the design work? I design it slowly... I tend to look at references, and sort of break it up into chunks along lines within the model. With this one i think i stated from the top center gun section since it was a simple shape. Then i'll add a piece for the front top curved head section, then bits under that... and so on and so on, and basically build it up to get the basic shape. Then i'll start adding detail to each section until i have a big solid ship. Then depending on the size of the pieces, i'll start carving it up into print size pieces, then hollow it out, then add assembly tabs, holes etc. I kind of think of it as carving a chunk of virtual wood lol. Eureka, after going through 3 different designs for an internal frame this week, i've finally got one that works and assembles the way i want! I have about 95% of it printed, theres more printed than in this pic, but they're detail parts, panels etc that if i taped on it'd be nothing but a mass of yellow tape. It doesnt have the details on the top, nor on the side pontoon/gun things so they look a bit dull for now, but they're printed and ready to be glued on after some sanding. Printing more of the front antenna atm, then the only real parts left are the top and bottom guns, and the rear engine panel. Have a box full of superseded parts from different internal frames, and detail parts where i missed something, or forgot to add a screw tab to or something! What printer are you using? Looks like its putting out some high resolution prints. I've got a couple of printers, just i3 clones, but i've spent time getting them tuned properly, so i get pretty good results.